This last month I've had the good fortune to be able to satiate my appetite for the works of Shostakovitch. Firstly with the Borodin String Quartet on their New Zealand tour, with a fabulous performance of Shostakovitch String Quartet no.9 at Auckland’s Town Hall. On this occasion I was lucky enough to get seats in the circle overlooking the stage, here we could really feel a part of the drama, the serious determination and passion really gave the impression blood had been spilled. I was particularly drawn in by the extraordinary cello solo accompanied only by the light tremolo of the upper strings. I then attended this past weekend's performance of the Shostakovitch Cello concerto performed by Johannes Moser and the NZSO. Once again at the Auckland Town Hall, the city’s premiere classical venue. Tickets are pricey though, especially with all the added fees, so this time we were at the back of the stalls, but it didn’t matter, the sound was great and although I do like to observed peoples technique, I couldn’t help but be overwhelmed by the energy, even at that distance. The concert started with the Borodin Overture to Prince Igor. This was a delightful entree, as with any fine meal, the entree should be not too heavy but enough to whet your appetite for the main course, this did exactly that. As someone said to me, it could have been the soundtrack to a western, it did have that kind of feel. Johannes entered the stage to great applause wearing all black, his top, half something shiny (vinyl maybe? ), reminiscent, I thought, of Star-trek, a welcome variant to the traditional tails. My thoughts were that this guy is a bit of a rock star, I would not be disappointed. This first concerto by Shostakovitch was written for Mstislav Rostropovitch in 1959, who remarkably memorized it in just 4 days. There is so much complexity both technically and emotionally in this work, listening to it I find myself being put through the ringer, to play it, undoubtedly even more so. From the first opening theme, the passion and vigour with which Johannes plays is evident. He is an extraordinarily physical payer, but not in a forced or pretentious way. He appears to be enacting the music, he and his instrument are one being, and the sound and energy is mind-blowing. Fairly near the opening, one particularly wide and energetic bow release knocked the concertmasters stand, recovery was instantaneous, there was an authenticity to it, sometimes unexpected stuff happens, I like that. The second movement follows with a dreamy folk like melody, where the first movement was smacking you in the face repeatedly, this has a weeping, heartfelt type of intensity. Johannes transitions seamlessly between the light, almost hopeful and innocent themes, to those darker and more intense, his presence soaring above the orchestra even in the most delicate of moments. The movement culminates in the theme once again but this time as flawless and haunting harmonics. When I’ve taught my young students to play harmonics for the first time often their reaction is that they sound scary, like a horror movie. I don’t recall ever hearing them that way, until now. It was terrifying! Clearly not everyone around me was as transfixed, with all the shuffling and wriggling and squeaking chairs, it was quite off putting. I'm not sure if it was written to be comical, but the jumping five note runs leading in to the 4th movement lead me to start giggling. I wonder if it was more a reaction to the nervous energy, the way some people start laughing as a defence mechanism when witnessing something gruesome. Johannes and the NZSO had me so immersed in this music that this type of visceral reaction was inevitable. The final movement burst forth with the same, if not more, raw passion and energy as the first. 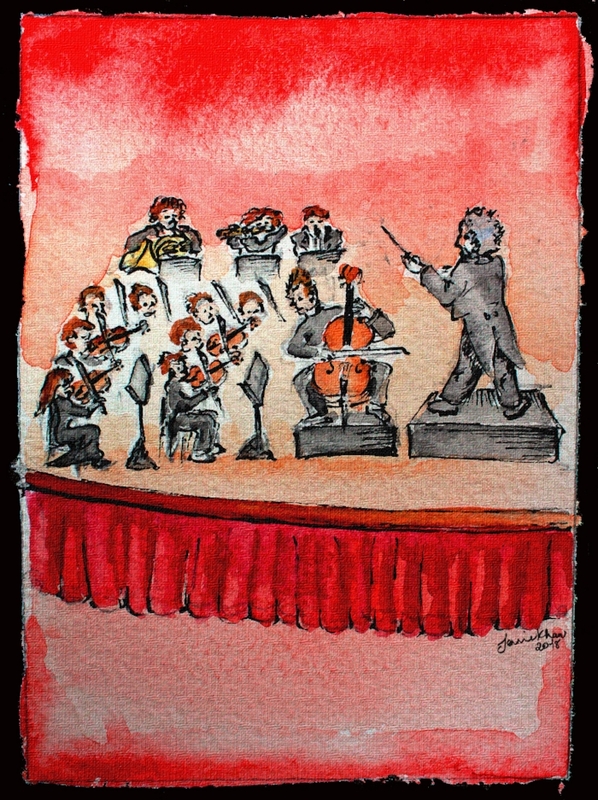 There was a fabulous connection between the soloist and the orchestra. Johannes physically connected with the a players, they were connected as people as well as through the music, we don't always see that, and it really elevates the overall experience. At the conclusion, to a rapturous applause, the only word I could utter rhymed with duck, it was such a phenomenal performance, I was otherwise speechless. The encore came shortly after, apparently to "clear the air" They played Elegy by John Williams, indeed a very beautiful work, still full of sadness and anguish. But on second thought anything lighter and more uplifting would have been incongruous. The second half the NZSO played selections from Prokofiev's Ballet Romeo and Juliet. I am a big fan of Prokofiev and love to hear the Dance of the Knights. But for me there was something lacking in this as a programme choice, despite the intention as a stand-alone work, it felt disjointed and long. I would have preferred maybe one of Prokofiev's Symphonies to keep the momentum going. All credit to the NZSO it was a massive play and under the baton of Peter Oundjian, his debut performance with the orchestra, they gave us a stunning evening out. After the weekend of concerts, Johannes did a great interview on RNZ with Kathryn Ryan that you can listen to here. What in interesting person, his character clearly comes through in his playing.